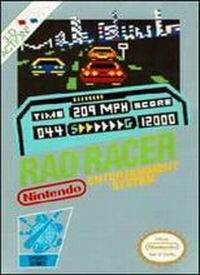 Rad Racer original NES Nintendo Game cartridge only - Cleaned Tested and Guaranteed to Work! Rad racer worked the first time. Looks brand new and its fun to use the power glove with it! Such bh classic and quintessential 80's game! Hard as heck but so fun. And like absolutely everything from lukie games, it was in wonderful condition! Works great, just like I remember it. Fun little game. Fun game, easy to play. Rad Racer's gameplay is very simple - you race cross-country and try to get to the goal line of each course before time runs out. This is not a racing game in which you do laps around a course and try to come in 1st place. You don't have to beat your opponents in this game, you just have to avoid them. I've never understood why the trees only grow right next to the road and nowhere else. 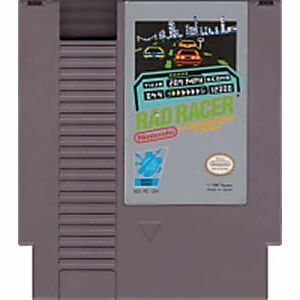 Good classic NES arcade style racer game nevertheless. Simple Racing at it's Best! This is one game that I never forgot growing up. It is a simple racing game with simple controls. Don't worry about upgrades and stuff like that.....just get to the checkpoints before time runs out! Press "Down" on the d-pad to cycle through radio stations as you burn rubber. This game never gets old. It is always fun to pick it up and see how far I can get. A good game for a really good price. A must for any nes collection! 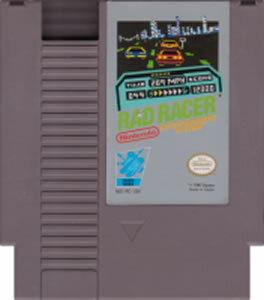 The best racing game on the NES period. Fun times.Thank you Lukie Games.